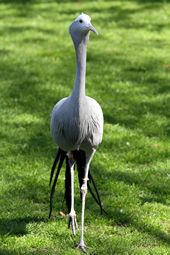 Also called the Stanely Crane or Paradise Crane, the Blue Crane is a tall ground-dwelling bird found in southern Africa. The largest population is found in South Africa, and this species happens to be the national bird of South Africa. As its name suggests, the blue crane is pale blue-gray in color with a darker upper head, neck and nape. Its plumage is lighter and sometimes whitish in color, and its bill is ochre to grayish in color, with a pink tinge. Most crane species have red patches of skin on the head, but this species of crane does not have them. It has head feathers that the crane can erect when excited or when they are aggressive or threatened. Young blue cranes are lighter in color with a tawny colored head. Blue cranes eat seeds of grasses and sedges, waste grains, insects, and small vertebrates. They are partially social, but less social in breeding season. They are found in dry grasslands at high elevations where there are less disturbances. They are also migratory, and in the autumn and winter, they usually move to lower altitudes. Breeding and roosting occurs in wetlands (if they are available) between October and March, and some cranes prefer nesting in arable and pastureland. To attract a mate, the males engage in a dance, flings various objects in the air, and jumps. When a female accepts the male, she joins in on the dance and mating begins around two weeks later. Females lay between one and three eggs, and both male and female help to incubate it. Incubation lasts around 30 days, and the young are able to walk and swim after two days. The parents care for the young up until the following breeding season and then are chased off by both parents. This species is classified as vulnerable. 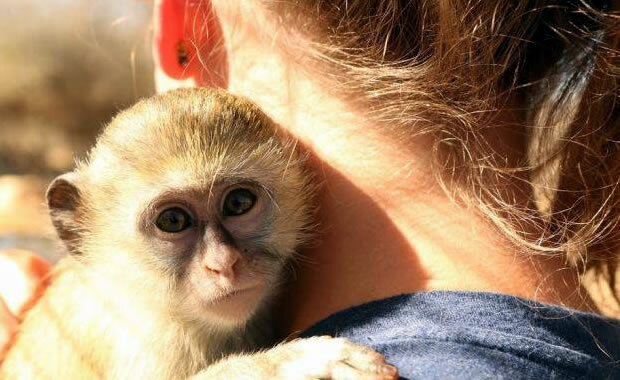 Threats to the species include loss of habitat due to human population growth and the conversion of their preferred grassland habitat into commercial tree plantations. Some cranes have also been poisoned deliberately to protect crops. Some are also killed accidentally during crop dusting. In South Africa, the blue crane has gained legal protection. Other conservation efforts include research, habitat management, education, and sanctuaries provided by private landowners. Copyright Notice: This article is licensed under the GNU Free Documentation License. It uses material from the Wikipedia article "Blue crane". Glenn, C. R. 2006. "Earth's Endangered Creatures - Blue Crane Facts" (Online). Accessed 4/20/2019 at http://earthsendangered.com/profile.asp?sp=14646&ID=1. Need more Blue Crane facts?